Puerto Vallarta, Mexico, has it all. Dazzling sandy beaches; beautiful sea and mountain views; picturesque, cobblestone streets; stylish restaurants; and, of course, a lively nightlife. It’s one of those places that will beckon you in and then make you wonder why you hadn’t been before. Kimberly was a special needs worker for several years. But even while she worked, she kept up her hobby of turning natural materials such as rocks and crystals into beautiful jewelry. This passion began in her childhood and has stayed with her and manifested into her current vocation. Opening a store in such a historic area comes with a bit more red tape—such as increased lighting and signing requirements—but Kimberley says that overall the process was pretty smooth, since she was a resident of Puerto Vallarta. Kimberly’s search for unique gems and stones takes her to cities like Mexico City and Guadalajara, both exciting places to visit. 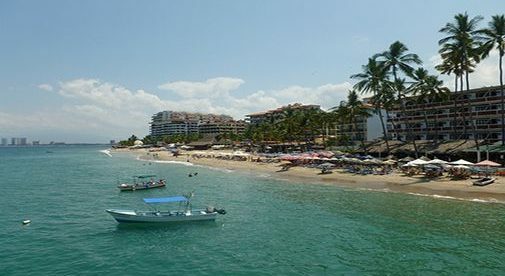 Living and working in such a historical and diverse part of Puerto Vallarta also gives her the opportunity to make friends with Americans, Canadians, Europeans, and Mexicans. One disadvantage is that Puerto Vallarta is a very transient city and Kimberly often finds herself missing people who move on or are gone for part of the year. Like so many others who have fallen in love with Puerto Vallarta, Kimberly thrives on the diversity of the city. Not only does she have Banderas Bay, the Sierra Madres, beautiful palm trees, and other lush plant life, she also gets to witness some of the most spectacular sunsets on earth. Additionally, there are beautiful, historic buildings in the 5 de Diciembre and Zona Romantica areas, and cobblestones pave many of the streets. There are also numerous restaurants and shops to visit. Of course, Kimberly has her favorite neighborhood spots, especially The Barracuda, a long-standing restaurant right on Carmones Beach. “After work, I may stop in at the Barracuda if I’m feeling energetic.” It doesn’t take long in Puerto Vallarta to become like family at a restaurant you visit often, and The Barracuda is like a second home to Kimberly. Kimberly is also an avid swimmer and likes to keep cool, especially on hot, humid days. Many of the resorts have special day passes, and she loves exploring those options. The resorts are great places to strike up new friendships. “I have met some wonderful people from all over the world,” Kim says. Kimberly has made a great life for herself in beautiful Puerto Vallarta. “I love where I live, and I love sharing Puerto Vallarta with family and friends,” she says. You might even meet her if you find yourself there.